John Golden, an opponent of a plan to build a four-story apartment building that comes with no parking spaces, explains the potential fight for spaces if the building is constructed in Portland. A motorist passes an 81-unit apartment building under construction in Portland. A bicyclist and motorist pass an 81-unit apartment building under construction in Portland. A four-story, 81-unit apartment building under construction at right shares a quiet side street with older houses in Portland. The building will include scores of bicycle racks but not one parking space for automobiles. PORTLAND — Though Portlanders are remarkably united when it comes to protecting the environment, a property on aptly named Southeast Division Street has provoked an unexpected backlash against the city's progressive approach to housing its burgeoning population. The general reason for the controversy — insufficient parking. But how this got to be a problem on Division Street typifies Portland, a place proud of its plastic shopping bag ban and global warming "action plan" but still struggling with how to grow while staying green. A developer, Dennis Sackhoff, last year demolished what had been the city's landmark lesbian bar and started construction on a four-story, 81-unit apartment building that will include scores of bicycle racks — but not one parking space for automobiles. It's one of about 30 parking-free apartment buildings that have been recently completed or are in some stage of development in the city, mostly in the cozy neighborhoods on the east side, across the Willamette River from downtown. Developers such as Sackhoff are capitalizing on one of the nation's tightest rental markets while following Portland zoning rules that require them to provide parking for bicycles but not cars. The people who already live in these neighborhoods worry about increased traffic and an inability to find parking in front of their places. And though the apartments are intended for those with a bicycle-first mentality, most of the new tenants are not choosing a car-free existence. 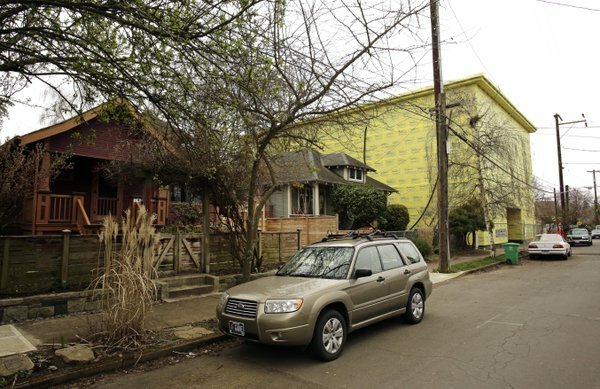 "The developer says he is trying to give Portland what it says it wants, but in reality, Portland wants it both ways," said John Golden, a high school teacher trying to stop, or at least reduce, the size of another four-story apartment building in the works near his northeast Portland house. Sackhoff, who declined to be interviewed, is the developer on that project, too. Portland has carefully charted a course that has made it one of the most environmentally friendly urban areas in the country. Its strategic planning emphasizes the use of alternative forms of transportation, such as light-rail, a streetcar, skateboarding and bicycles. A major bridge is under construction across the Willamette that will be off-limits to cars. The zoning rules and planning goals that spawned the surge in parking-free apartments were meant to discourage people from owning cars and also entice developers to build apartments closer to downtown, limiting the type of farmland-devouring sprawl seen in many U.S. metropolitan areas. Mayor Charlie Hales was on the City Council in 2002 when it approved a zoning change that allowed housing to be constructed without parking if it's within 500 feet of a bus or light-rail stop with frequent service. That's defined as an arrival every 20 minutes. Hales said he envisioned developers building condominium- or townhouse-sized apartments on top of retail stores. He did not expect boxy, four-story buildings packed with studios and one-bedroom apartments. For almost a decade, his vision was right. But then Portland found itself with an apartment shortage following the condominium boom and ensuing real-estate bust, and developers saw a chance to fill the desperate need. Hales said he remains a champion of "density," a word you hear a lot in Portland, but the city has to make adjustments so that future buildings better "fit into the urban fabric." "It is a good thing that we're building up and not out," Hales told The Associated Press. "But we also have to be pragmatic in the present day. People still own cars." The city's Bureau of Planning and Sustainability has proposed that developers of larger buildings — those with at least 40 units — include at least one parking space for every four units. Hales said he has yet to decide if that's the right target. Joe Zehnder, Portland's chief planner, said the city is looking for a middle ground that takes some pressure off of streets like Division but does not create so much parking that the city is one day awash in unused spaces. Car-sharing programs are proliferating and the national trend, especially for younger people, shows a decline in vehicle ownership, he said. Justin Wood, a developer and associate director of the Home Builders Association of Metro Portland, said Zehnder's idea is a good compromise for a city that wants to limit sprawl, steer people away from driving and have relatively affordable apartments. According to city estimates, it costs developers $3,000 per space for surface parking, $20,000 per space for structured parking and $55,000 per space for underground parking. Wood notes that many of the planned buildings are on small lots, making it a challenge to install parking spaces. Wood said he wouldn't like to see a four-story building with no parking rise next to his house. But the only other way the city could handle the newcomers is to embrace the suburban-style growth that makes most Portlanders cringe. "You're not going to stop people from moving to Portland," he said. City leaders want to see them in neighborhoods with a mix of residential and commercial structures, so people can be a quick walk or bike ride away from restaurants, coffee shops and grocery stores. A city survey of residents in the parking-free buildings found that 72 percent own cars, but only half that many drive to work. They keep a vehicle for trips across town or weekend getaways. Ryan McGuire, 30, moved to Portland from St. Paul, Minn., last year and lives in the 50-unit Irvington Garden Apartments. The building in northeast Portland has more than 50 bike racks but no parking. McGuire said he and his girlfriend both have bikes and share one car. As the city survey suggests, McGuire said he keeps a car to go snowboarding and "haul stuff." On-street parking also does not appear to be that difficult to find on Division Street, the epicenter of the apartment boom. Ample spaces were found during three recent visits to the neighborhood, on different days and at different times. That, however, will likely change when more of the planned apartment buildings reach completion, including the 81-unit building that is the largest project on what has become a trendy stretch of the city. Construction on that building has stopped, at least temporarily, because of an Oregon Land Use Board of Appeals ruling that involves a technicality unrelated to the lack of parking. Elisabeth Varga, who lives near the building and was one of the people who filed the Appeals Board complaint, emphasized that she and other opponents favor density, as long as it's done responsibly. Zehnder, the city planner, said Portland's policy goals of becoming less car-dependent while growing taller instead of wider appear to be working, but he understands why it may be alarming to residents such as Varga. "Now you're seeing it," he said of the density. "And it's one thing to think it hypothetically, it's one thing to see it happen and it's another thing entirely to see it happen as much at one time as they're seeing it on Division." Editor's Note: The "smart growth" planning fad began about twenty years ago in Portland, Oregon. The city has been on a massive building binge of "compaction and densification" inside the "urban growth boundaries. The city is upzoning suburban areas with apartment buildings destroying suburban neighborhoods (aka "Sprawl" to the chic set) in the belief that people will take more mass transit. We can expect upzoning to come along the "101 Urban Corridor" now pushed by Susan Adams and the rest of the Board of Supervisors. Replacing our suburbs with dense urban living is the ultimate objective of Plan Bay Area. 81 unit building on a tree lined street with no parking.